With full-length windows between the wood flooring and exposed concrete ceilings, every apartment at Sequel offers industrial-chic design in a boutique community setting. Stainless steel appliances and stone countertops come standard, while options such as attached dens are available in select homes. The luxury continues throughout the community with an equipped fitness center including Guided Fitness, which are free onsite fitness classes that are available to all Sequel residents. 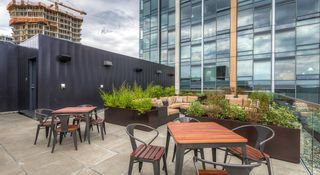 We also offer a stunning view of downtown Seattle and Pike Place Market from the rooftop lounge and other exclusive resident perks. Take advantage of the concierge, twenty-four-hour valet or a la carte services, including personal trainers and in-home spa treatments. Pet Policy: We welcome 2 pets per apartment home. Pet Deposit is $300 per pet. Pet Rent is $40 per pet. For more information, please call our leasing office. Parking Comment: Self-park or Valet. Valet parking is $350 per vehicle, or an assigned self-park space is $300 per vehicle. Please call for more parking information.